Position the “unlocked” 4-Tab for optimum comfort and function. AVOID placing 4-Tab on base of the neck. Greater comfort is typically achieved with the 4-Tab located low on the back (about the level of the bottom of the shoulder blade). ALTERNATE POSITION: Locate the 4-Tab over the lower half of the shoulder blade of the involved shoulder. AVOID placement over any boney prominence. 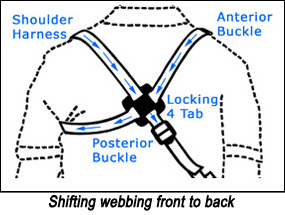 Occasionally, lower 4-Tab position can be achieved by shifting excess webbing from front to back (see below). To do this, move anterior buckle toward the 4-Tab, work the extra webbing through the 4-Tab, around uninvolved axilla (readjust axillary pad position) and through the 4-Tab again toward the posterior buckle. The 4-Tab can then be moved lower on the back. 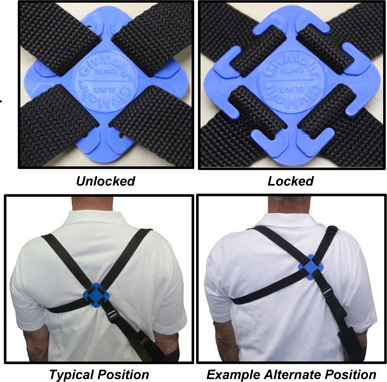 This adjustment can also be used to relocate the anterior buckle for comfort.